Moved to Milford, Virginia in 2006. As long as I can remember I have dreamed of owning my own Farm. Found this beautiful 25 acre piece of heaven and fell in love. I am an established name in the community, I Raise and Board Horses, sell Pigs, Rabbits and Eggs. I offer farm and pet sitting, horse boarding, animal sells, eventually kenneling will be offered. I also do rescue and re-homing. 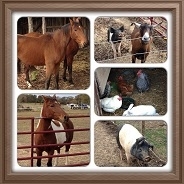 Click here to see up to date information on the our current Animals and Farm activities. Monday-Friday 4:30 p.m. – 9:00 p.m.